Having problems with missing text on this site?? Look here. European Intuitive Music Conference (former Intuitiva and DIMC). An annual meeting around improvised music. Composer, music coach, music therapist. Literature, full-text articles by CBN and others. Selected links with relevance to improvised music. 3 SOLOKONCERTER I 5E I KØBENHAVN I MARTS 2019 ! EUROPEAN INTUITIVE MUSIC CONFERENCE - DATES & INFO OUT NOW - HERE! My Site Carousel has been repaired for dead links and is perfectly fresh and functioning again ;-) ! EUROPEAN INTUITIVE MUSIC CONFERENCE - PRELIMINARY PROGRAMME OUT NOW - HERE! IMPROVISATIONSKONCERT I 5E! SE HER! CALL FOR PARTICIPATION: master degree dissertation writer from Brazil invites all interested to record a creation of a text score by Didier Guigue from 1980. See more here! Master study in free improvisation?? Yes, it exists in Basel... and you have the chance to hear the present class Sunday 4th March in the Concert Church, Copenhagen. More here! Intuitiva musicians' retreat has a new name and place - look here ! Graphic Scores. An exhibition of contemporary approaches to graphic scores to mark the 50th Anniversary of the British Music Collection. Curated by Jacob Thompson-Bell. Graphic Score Explorations. Curated by Christina Vantzou, recorded in Les Ateliers Claus, Bruxelles. 171111 Maria Frejs klassiske artikel fra 1997 Det konserverende konservatorium kan nu læses igen, på trods af problemer med Dansk Musiktidsskrifts database. Der er et link fra min litteraturside. Jeg har scannet artiklen selv og endda forsynet den med keywords og resumeer på dansk og engelsk. Oh! My Mini-Handbook with exercises for practioners of improvisation has suffered from a dead link for some years - now corrected. Also some important, recent updates of my literature page have been made. German improvisor Carl Ludwig Hübsch is compiling interviews with improvising musicians here: http://blog.huebsch.me/ - with a special focus on the communication aspect. Concerts in Copenhagen - Open Form Festival 2017 and more! UDSTILLING af danske komponisters notationer til og med august i Kbh - se her! 170321 So nice to know visitors here read the old news. I now revised all the previously dead IIMA links below! Intuitiva meeting. See about it, including the new programme here ! 170321 New Danish release with graphic scores! See the bibliography and newletters here. 170110 Intuitiva has now dates! 160928 After I've been Artist of the Month at the venue 5E in Copenhagen in October, here are videos of TWENTY playing sessions involving NINETEEN Danish and other musicians... and I think it sounds interesting! Make any vocal sound, but always go downward in pitch from the initial attack. The initial attack may begin at any pitch level. Go downward in a glissando or in discrete steps continuously. Go any distance in range, at any speed, dynamic or quality, but the breath determines the maximum length of any downward gesture. A remarkable video - showing improvisation with electronics in an unusually lively way! 160816 INTUITIVA page updated. Read about what we did and changes to come! 160811 An upload error has been corrected. It previously resulted in a dropbox folder being shown instead of the proper front page. Apologies! NEW INTUITIVA PROGRAMME for summer meeting 27-31 July near Wroclaw in Poland! Hurry to see and download it here! 160308 Do you know Logos Foundation? An important European center for experimental and improvised music. The alternative place to go first of all for touring musicians from outside - and inside. An institution with a large archive of paper and audio materials. Now in danger of losing all funding from the Flemish Government. Petition here! I have now several times served as a censor at the highest postgraduate level of composers' education (Solistklassen) at debut concerts at the Royal Danish Academy of Music in Copenhagen. Looking at my background as a composer who did not graduate from this institution, I find it remarkable. I can consider myself an autodidact as to the craft of new music composition, even if I also graduated at musicology at the University and have received inspiring impulses there. During my studies I also started to compose and become a part of concert life, more and more emphasising the aspect of openness in composition. I taught experimental composition on an elementary level during many of the 31 years I taught the subject of Intuitive Music at Music Therapy, Aalborg University which I built up myself and in which examinations were carried out for many years. My activity in concert life and with guest workshops in Denmark and internationally grew. From time to time I had opportunities to teach workshops also for students of composition at Copenhagen and elsewhere. - Conservatories are obliged to serve the market of classical music, and experimental music forms are marginalised, even if they are also cultivated to some degree. However, traditional notation is usually preserved in slightly updated forms. This forms a strange dualistic contrast to the more collaborative ways of planning and carrying out compositions having emerged ever since jazz began to influence Western culture, especially considering the present situation in which conservatories have begun to introduce improvisation into their curriculums. Being a representative of radical endavours to cultivate innovative forms of notation and collaboration with musicians, I am very glad and honoured to be shown the confidence of being one of those who decide about artistic quality in such a sensitive situation as an exam on a high level. I believe our being in touch with each other can be strongly constructive. 151214 Copenhagen Openform Festival 2015 - 2 new videos here! 150928 Meddlings - New composition published at IIMA by Henrik E. Rasmussen, recently performed at Gong Tomorrow Festival in Copenhagen. 150928 GAME PIECES CONCERT IN COPENHAGEN 31th October 2015! 150823 INTUITIVA 2015 took place again. Dates for next year to be announced by 1st of October. More here. 150819 New blog page with great graphic pieces... thumbnails could not do any justice to it, so click here! 150606 How often have you heard of improvisors receiving high official distinctions for their art? One instance happened right now, 3.July in Zamosc, Poland. Pawel Dudzinski became the eigth citizen to be honoured with a permanent plate in the "Walk of Fame" for his intuitive theatre. He will again participate in the Intuitiva New Arts Conference 2015. INTUITIVA NEW ARTS CONFERENCE (former DIMC) July 29 - August 3  IS UPCOMING! What is "TWO DIMENSIONAL IMPRO?" See the answer here and the preliminary programme! Anyone with interest in graphic and other new notations and improvisation - LOOK HERE at this fantastic collection from Great Learning Orchestra in Stockholm! ALL pieces - and there are MANY - can be HEARD too! 141124 There is a great exhibition on in Stockholm of graphic notations, 30.August - 30.November, "No sound is innocent". See Marabouparken's homepage - and browse Great Learning Orchestra's homepage Be aware that even if updates are sparse, the orchestra is in full vigour, as is apparent from the exhibition programme - and their Facebook page. 140128 Ny IIMA tekst af Tine Hinrichsen. IN DANISH Læs om Lars von Triers "benspænd"-begreb og dets relevans for improviseret musik! 140114 Upcoming improvisation symposium in Prague in July with a large group of notorious American researchers from the West Coast, including George Lewis, and some Canadian ones. Deadline for paper/presentation/workshop submissions 6. of February. All relevant researchers, look here. 131211 For music therapists: new article discussing therapy relevance of free improvised music. Call for graphic scores... http://www.voxnovus.com/15_Minutes_of_Fame/calls/#13-08-16! Hvis du kommer ind i eller forbi Diamanten (Det Kgl. Bibliotek nede ved havnen i Kbh. ), så kig ind - gå frem og se udstillingen om grafisk notation lige tilvenstre og tilhøjre for Dronningesalen! Husk, fedt release party i København søndag 28. april på Frederiksberg - mere her! Great documentation from a Montreal workshop series "Musiques improvisées et partitions graphiques des années 50 à aujourd’hui" here. New audio recording from improv duo concert in December 2012 featuring Carl and Kresten Osgood at Carl's sights and sounds page. Again, I got high on uploading summaries of various interesting literature in my bibliography. Amelunxen, Christoph Herndler, Eddie Prèvost (the third book of thoughts by this distinguished improvisor), Nina Polaschegg (overview of recent literature about free improvisation in German), myself... - here. S.C.E. - a new large collection of graphic pieces by me has been completed now after several years of work! See examples below - and you may download the entire collection here (and learn what the letters mean)! DIMC programme is now up! Moscow Contemporary Ensemble recently performed my Graphic Journeys from the Collection From the Danish Seasons. Russian article here. NY ARTIKEL: Hinsides intentionerne. Om flertydighed. NEW SMALL SECTION: BAD REVIEWS. Perhaps our CVs are often too boringly alike - we are all praised by critics, have received distinctions and prices and have a splendid artistic production. But what's it all about? Do these CVs tell clearly about what is really our striving, or is it neither here nor there? Someone gave me the idea of quoting also my bad reviews. They might tell something about the cultural context... Look here for English version and here for the Danish (you may have to scroll down)! NEW ARTICLE by Carl Bergstrøm-Nielsen about free improvisation and its terminology. On the background of my presentation at the symposium "Flirting with Uncertainty. Improvisation in Performance", University of Exeter, England, March 2010. It is going to appear in the online magazine Music and Arts in Action, but it will take around a year, so till then, here is a pre-print. GRUPPEN FOR INTUITIV MUSIK, grundlagt 1974, spiller på Islands Brygge i Kbh. torsdag den 21. juli kl. 20 - se under koncerter! IMPROVISATION - NU OG FØR. Artikel fra 1995 nu oppe - se her. Det er svært at sige meget og systematisk om improvisationsmusikkens nyere historie, men her siger jeg dog lidt. Så jeg har fundet det værd at fiske den frem. Den har været trykt i Dansk Musiktidsskrift, men mangler i den indscannede online-version. PROUDLY PRESENTING! Prose scores by Frederic Rzewski out at IIMA ! Programme for Denmark's Intuitive Music Conference is out ! Denmark's Intuitive Music Conference has now dates for August 2011! New article by Nina Polashegg up at IIMA - look here - on the relation between improvisation and composition in music history since 1945. A significant contribution to a nescessary revision of music history. DIMC 2010 info now up! Videos! Discussion! Compositions! German cellist Roland Greater will play 365 improvised duo concerts during 2011 at various places in Germany roughly between Stuttgart and Berlin, as well as in neighbouring countries! If you feel like participating, do take contact - more info in German at his homepage: www.musikmarathon.com. See also www.rolandgraeter.com. which happens on Suturday, September 18, 2010.
contribute to the world , through the events for improvisation. You can practice improvisaion at any style and venue you want. concepts and practices of improvisaion. 100622 The DIMC preliminary programme has been updated. 100622 My bibliographies about Experimental Improvisation Practise and Notation at IIMA have now been updated again with new exciting thoughts... those interested in notation, don't miss the new entries about Cox, Kopp, Sauer and Solare in category (E1) in the addenda! 100411 Here is an improvising band which refuses to do the standard image branding: a group of Danish artists, including Svend Danielsen, has long made sound performances from time to time, but each time under a new band name. The two last ones were "Fiktive Frisører" (Fictious hairdressers) and AS Lydløsning (Soundsolution Inc.) - with video clips to be seen and heard on Youtube (click on the names above...). They have also the homepage www.splatterjazz.dk - in Danish, but with sound clips (direct link to them here). 100320 After 3 days of breakdown, the site is up again!! This time, my provider suddenly disconnected the service and did not reply to mails (!! ), but thanks to the domain name we are now up elsewhere. 100114 John Zorn's Cobra from 1984 is now available on the net! This is a famous piece for improvisors, and the recent concept of "game pieces" took its start with Zorn. Numerous recordings have long been out, but now you can see for yourself what were the rules of the game. See it here. You may also like to see some more easy-to-do pieces of the same kind by Shiba Tetsu here. 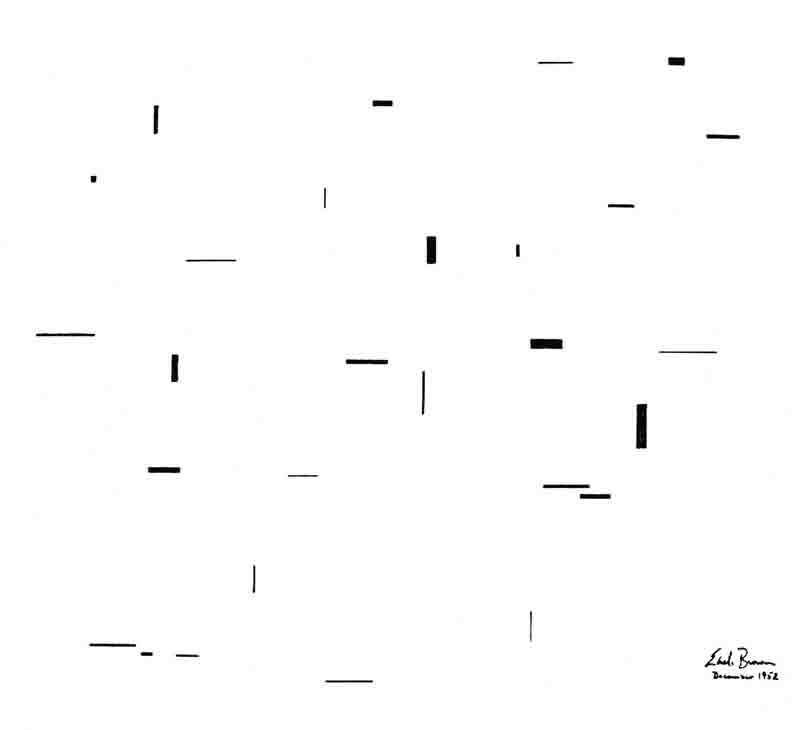 100114 New link: Collection of graphic scores at New York Miniaturist Ensemble. 100113 Åbent improvisations-træf hveranden søndag i Hillerød! Se under koncerter! 100105 Stockhausen Kürten Summer Courses 2010 31.July - 8.August will now include a course on intuitive music by Stockhausen, led by the Ensemble for Intuitive Music Weimar. See more here! This year in June, German composer and a pioneer for integrating composition and improvisation, Erhard Karkoschka, died at the age of 86 years. Karkoschka was influential as a professor of composition. His "new Music notation" is the best known book on new notations worldwide (German: "Das Schriftbild der neuen Musik", 1965; English: "Notation in New Music", London/New York 1972; Japanese: ZEN-ON Music Company Ltd., Tokyo 1978). Compared to other books that catalogue new notations, this has the virtue of presenting a number of music works in their entirety in the last section. In his article "Aspects of group improvisation" (first publ. in German as "Aspekte der Gruppenimprovisation" in Melos 1, 1971), he described how improvisation practise was at the same time connected to new sounds beyond those that could be written by traditional notation as well as to a liberation of both individuals and of the group. Read the article here, it's certainly still of interest! 091210 New article up (from 2008, revised): The picnic principle. How improvisors co-ordinate their playing of consecutive sections in open compositions. 091120 New review of music by Jeff Kaiser and collaborators. 091018 New PhD on improvised music - see last item in the links section! 091001 JASMIM, The Japanese Association for the Study of Improvised Music, has held its first congress. See the programme in English translation here! 091001 CBN compositions listening page has been further expanded with a video from Japan this summer - look here! 090908 CBN compositions listening page has been expanded - look here! 090821 Ge-Suk Yeo, improvising singer and composer, has created a special kind of multimedia show. "Imaginary signs" appear in changing forms, in projection, while musicians are playing with inspiration from this. "Klang Drang" is a piece recently performed in Portugal by a large ensemble, including Evan Parker - see and hear an excerpt at her homepage. 090813 Denmark's Intuitive Music Conference 2009 was again held in Svendborg. This year with participants from seven countries! Documentation is up at the dimc page. NEW: large sound files! 090805 New Link on a Piano improvisation method based on the piano works of Toru Takemitsu by Danish Niels Chr. Hansen. See the end of links section! New review of a graphic elements/conduction release here. 090603 New review of a Stockhausen release here. NEW, EXPANDED version of my mini-handbook with improv exercises here! 090322 Spring is slightly approaching in my part of the world. Birdsong section revised, new recording and spectrogram added for Sparrows. 090308 A very good text by Christopher Cox about the historic development of new notations is up at the homepage of San Fransisco gallery New Langton Arts - here! Sorry for the interruption in previous weeks. My provider suddenly disconnected the old URL. Everything should now be up again here. If you read this, you have reached the new domain of my own - www.intuitivemusic.dk ! PLEASE UPDATE BOOKMARKS + LINKS and PASS IT ON! Stockhausen-studiekredsen FORTSÆTTER. Læs mere her! 090113 Nyt i links: Mads Nørregards orlovsprojekt efterår 2008. Kommenteret samling af øvelser. Mads N underviser bla. i "Open Door" musik på Den Rytmiske Højskole i Holbæk. 081128 Review of the two Stockhausen Aus den Sieben Tagen Concerts transmitted in BBC 3 "Hear and Now", on the 1st and 8th November 2008 under "Guides" at this homepage - direct link here ! 081012 Denmark's Intuitive Music Conference 2009 now has dates already! 081009 Vokalorkestret i Århus har oprettet en hjemmeside. Lyt til improviseret vokalmusik og se om koncerter! De 12 forelæsninger på Folkeuniversitetet er blevet til 9 i en privat studiekreds og starter nu onsdag den 24.september. Læs mere her! 080820 Interview auf Deutsch mit CBN hier. 080818 New page "Listen to Carl's music"! 080817 One more successful DIMC meeting - read more here! 080619 Carl Bergstrøm-Nielsen bidrager til 12 forelæsninger på Folkeuniversitetet i Kbh. startende onsdag 3.september 2008. Læs mere her! 080526 Concert organisation KANTEN still exists in Copenhagen! It just changed its domain name without notice. Look here!. 080516 CBN and a number of Copenhagen improvisors will play at an improv festival 27. and 28 of May ... more here!. 080515 Korean improvisor and composer Ge-Suk Yeo (living in Hamburg) has several great video clips with sound and graphics on her homepage. See "Time Sculptures III" and the other ones here... (and more yet on the front page). See also about upcoming Copenhagen concert 19.May 2008 here. Agrell, Jeffrey: Improvisation Games for Classical Musicians. 500+ non-jazz games for performers, educators and everyone else, Chicago (GIA Publications) 2008. As "500+" already suggests, this is a very large collection of improv exercises! Prèvost, Edwin: Minute Particulars. Meanings in music making in the wake of hierarchical realignments and other essays, Wiltshire (Matchless Recordings and Publishing), 2004. This book invites to debate. Are laptop musicians antisocial in the way they play? Which is the current impact of consumer society on improvised music? Read on... See my full summaries of these books here - please scroll down to the categories "f1.1" (for Agrell) and "g3" (for Prèvost) or search for the authors' names. 080425 Danish Composer Henrik Colding-Jørgensen has revised and restored old paper materials of his piece Museik from 1979, consisting of 10 graphic sheets and an explanation. See the new version here. See also his other pieces Image (1992) and Chaos (1982) for free download here - scroll down to "Other music for free download". David Borgo: Sync or Swarm. New York (continuum), 2005 - looks like an important book in our field ... see excerpts of my summary right here below. At the end, you will find a link leading to the full summary. ... the second chapter titled with the poetic circumscription “Reverence for Uncertainty” deals with the history of improvised music and discusses some issues of essential interest: the views of performers, of listeners, and issues related to recording and to criticism....These 22 pages seem to be one of the best introductions written so far to this field of music for students and other interested readers. Starting-point is jazz and how its improvisation aspect has been both restricted and re-activated during history. The author moves on to mentioning developments of composed music since Schoenberg, extending into Cage’s ‘indeterminacy’ and Stockhausen’s ‘intuitive music’. ...The author next plunges into an extensive discussion of the diverse existing views of improvised music and its culture. One of the many comparisons made is between Evan Parker and Derek Bailey, bringing up issues which concern how much the music should assert an individual style and the cultural context with which the improviser identifies himself – and how much an aesthetic exploration in its own terms. ...The subsection “Experiencing Uncertainty” deals with listening to improvised music. Reference is made to several views stressing the importance of shared knowledge between performers and audience that the music is created here and now. Other views concern the absence of form references and the creative role of the listener following from that, the description of different basic kinds of listening, the importance of listening with a non-traditional focus (which could be textures or the changing appearances of figure/ground/field), and discussions around the terminology with which to describe the multi-cultural, pluralist interaction aspect. ...Next subsection “Documenting Uncertainty” deals with recording practise. The reservations made by many improvisers are mentioned, and contrasted to Martin Davidson’s view (director of English Emanem Records) that improvisation (probably because not being repeatable) deserves and needs it more than composed music. Mention is further made on different attitudes among improvisers on editing and adding recorded material. And of the practical advantages of recording – keeping up a tradition, getting to know each other and making understanding easier because it allows for repeated listening. Improvised music may be seen as a “post-literate”, oral tradition. Missing copyright and royalties recognition is mentioned here as an example of how improvised music is still not recognized by the common cultural norms. See my full summary of this book here - please scroll down to the category "g1.1" or search for "borgo". 071209 Debatindlæg til Politiken - om Stockhausen og Aus den Sieben Tagen. 071207 Karlheinz Stockhausen, born 1928, died Wednesday 5th. Besides being a pioneer of electronic and note-written experimental composition, he played a decisive role in the development of a new instrumental performance practise within European composition, in which choices and creative collaboration was left to the performers. This began in Klavierstück XI in 1958 and became elaborated in works of the sixties such as Adieu and Zeitmasse and was continued in the works with "plus-minus" notation later in the same decade like Plus-Minus, Kurzwellen and Sternklang. These works still are a challenge to composers, as they show examples of how musical ideas can be notated in outline without sacrificing contemporary ways of musical collaboration in a teamwork. This is even more true of the verbally notated collections From the Seven Days and For Times to Come (1968 and 1970, comprising 31 pieces in all) which do completely away with the arbitrariness of fixing many details. Instead, a flexible system ranging from describing strategic musical details to metaphors allowing for widely different individual interpretations with many steps in between were created and thus no less than models for compositional thinking which incorporated improvisors' way of thinking. For this, he coined the term 'intuitive music', because for him 'improvisation' was too loaded with pre-conceived ideas and cliches. He wanted so to speak "improvisation of a higher order" to happen. In the Group for Intuitive Music, we played many of these works - from the group's start in 1974 and on. In 1983 and 1996 we had long meetings with him. I am grateful for all the inspiration he has given me and others. It's hard to imagine what I would been thinking about experimental composition, had he not been there. Bibliography: experimental improvisation and notation practise 1945-99 - see the special section G2.2 devoted to Stockhausen! 071124 Denmarks' Intuitive Music Conference 2008 has now dates - 8-10. of August ... read more here! 070927 An excerpt from my Postcard-Music has been published at www.open-space.dk. Listen to excerpts of 3 different versions while looking at an animated version of the score here! 070905 Jamen dog! På min danske cd-anmeldelses-side har der siden engang i 2006 været en fejl, så linket til mine anmeldelser i DMT 5, juni 2005/06 slet ikke virkede! Men nu kan i altså se det - bla. om det gode pladeselskab Public Eyesore i Nebraska ..
070828 DIMC page updated with interesting materials from our recent 2007 meeting! 070802 Link added to links section to composers21.com. 070711 Since 2002, there has been a large, annotated bibliography on improvised music and experimental notations available through this site. However large, it does not go beyond the year 1999, though (with some exclusive exceptions only). I've now published a separate text with addenda, listing on materials published from the year 2000 and forth and to be updated every now and then. The old, large one is here and the new addenda is release with graphic scores! /legno1uk_add.htm">here - both are, of course, available from the CBN literature page inside. 070709 Any composers/creators of graphic scores and other innovative notation forms out there? Hurry to read about an upcoming anthology you might contribute to ... www.notations21.net !! 070706 New article Pluralism in contemporary improvised concert music. Some years ago, but the theme certainly has not lost interest. 070616 Time again for improvisors to think over whether they and friends are going to Denmark's Intuitive Music Conference this year 17-19th of August - New programme is out, see the DIMC page here! 070602 Two letters to the editor written in German for MusikTexte in 2002 and 2003 have been translated into English. The first deals critically with composers' attitudes towards democracy and how these are reflected in practise. The second deals with European serialism versus the avantgardism of John Cage and maintains that these two directions have ultimately much in common. - These texts have links from the CBN favourite literature... page. 070523 Ny artikel (på dansk) af CBN: Åbne kompositioner og frit improviseret musik (til gymnasielærere). 070301 BØRNE- OG FAMILIEKONCERTER MED IMPROVISERET MUSIK 4.MARTS og 15. APRIL - se koncerter. 070104 NYT LINK til artikel af Maria Frej fra Dansk Musiktidsskrift. Den er fra 1997, men jeg er igen og igen vendt tilbage til den i tankerne, fordi den for mig at se sætter fingeren på nogle centrale problemer. Som ny musik-folk er vi selvfølgelig da idealister og sætter altid kunst over pengene, ikke. Eller? Se CBNs Favourite Literature.. eller klik her. Debat er velkommen (fx. her). 061117 My article about Stockhausens' text pieces in the two collections From the Seven Days and For Times to Come (1968 and 1970) has now appeared at www.stockhausensociety.org. The article does not preach spirituality but seeks to make some much-needed, sober descriptions of what's inside for the musician in these 31 pieces - read the article and get to know more if you did not study the pieces before! And if you did, we might enjoy each others' company anyway. Info about Danish and German previous versions of the article also available there. 061013 Oops... late update of This Month's Quotation, apologies, but here it is. It includes a video work by Wojchiech Kosma made at the recent Denmark's Intuitive Music Conference 2006 - look here! Besides theorizing, it features a BIG CATALOGUE of 33 selected open compositions by my students, created during the years 1985-2006 in the context of my teaching at Aalborg University. So this is also a large anthology of a very special composition form. Take a look! And you might also try to PLAY some of them (you don't have to content yourself with listening to those 126 MB (one hundred twenty-six megabytes) of sound files included) ... as the compositions are there in extenso with English translations throughout. "Serial determinism and "intuitive music"". An article by Jerome Kohl, renowned Stockhausen scholar and managing editor of Perspectives of New Music for 14 years. Even so, such an excellent article, which elucidates how serial thinking is present in this important collection of open works, did not find its way to any republishing after initially having been printed in a small local Michigan magazine in 1978 - till now at IIMA. Proudly presenting! 060610 Carl Bergstroem-Nielsen's intuitivemusic blog has started ! New specially selected Email discussions with colleagues have been published here! 060601 SE HER! Et dansk cand. pæd. - speciale om fri improvisation, af Felix Becker. Indeholder bla. interviews med Ivan Vincze, Carl Bergstrøm-Nielsen, Randi Kjær og Helle Thun. Det er spændende læsning at studere sammenfatningerne herfra - ordnet i temaerne "Lyst", "Sammenspil" og "Frihed". 060519 Denmark's Intuitive Music Conference, international improvisor's meeting, goes strong again 18-20 of August! 060214 Still one more interview with CBN up here. 060127 Dansk-Japansk koncert i København 22. Februar! 060124 More practical details about Denmark's Intuitive Music Conference have been included ! - a number of Japanese organisations and individual homepages. 051219 Dates have now been fixed for Denmark's Intuitive Music Conference 2006 ! 050627 FOR DANISH READERS... Interview med Gruppen for Intuitiv Musik i Dansk Musiktidsskrift. Se det online her. 050625 New DIMC programme - Denmark's Intuitive Music Conference - out now! 050524 Opencomposition Forum - new discussion forum about CBNs composition ideas! 050502 Links section has become structured into categories. 050428 New link: Listen to SOUND SAMPLES from a lot of improvised music CDs with links to their companies at modisti.com - see links page! 050411 Change of date for Meet da Lama: 17. of april, not 22th !! Sorry!! 050410 New date for Meet da Lama: 22th of May! 050407 NEW LINK! ...how is your or your group's interpretation of this graphic score? ATSARA invites musicians to send in their mp3's (any length)! See one more invitation - and hear a lot of mp3's and enjoy videos with music and animations here! 050224 New initiative in Copenhagen: a meeting for improvisors every monday - look here! 050204 New link (IN GERMAN) to Ring für Gruppenimprovisation. Ein Must für deutschsprachige Improvisatoren/Innen ! 050104 For some weeks the email function from this site did not function due to an unknown provider problem. Is now corrected! 040823 Documentation of Denmark's Intuitive Music Conference 2004 is now up! 040808 Koncert med The Intuitive Trio onsdag 11.august kl. 17 på Christianshavn i Kbh. 040801 (DEUTSCH) Neues Kurzartikel von Carl Bergstroem-Nielsen: Einige Betrachtungen zur Intuitiven Musik. 040603 We can now happily pronounce Denmark's Intuitive Music Conference to take place again! Look here! Book: Wisdom of The Impulse. On the Nature of Musical Free Improvisation. 1998 (publ. by author), pdf version (IIMA) 2004. Part 1 (764 KB) - Part 2 (604 KB). Download. This comprehensive work deals above all with the analysis of typical phenomena and processes in free improvised music playing and it attempts to put up a consistent terminology to describe them. This set of concepts certainly deserves discussion! It's about alternatives and complements to such categories as theme, harmony, bass line, schematic form concepts etc etc which do often not suit the flowing and sound-oriented reality of free improvised music. For instance, 'transitions' (so typical of the music we make) between sounding 'identities' within the playing process are analysed into 9 categories, among which are 'feature overlap'. 'feature change', 'fragmentation' and more! - In addition, it provides insights into American free music life, including teaching of free improvisation, and a survey of improvisors maps opinions on questions of common interest. The book also features suggestions of exercises, both individual and group ones, which could carry on the conceptual discoveries, on a down-to-earth basis. Since long, Belgian visual artist Frank Maieu has illustrated the annual posters and flyers of the WIM Free Music Festival. Gallery here!! 040122 New Article by CBN: Sharpening the Process. On musical composition - interaction, communication, methods (2003). 091204 Koncert med Intuitiv musikgruppe, musikeren/komponisten Bent Nielson og lyrikeren Jan Hatt-Olsen. 031204 New link - to the great links collection Zu Casa. 030910 Due to an error, proper index page was unavailable for some hours, sorry. Don't be confused, everything is OK again. 030910 ANNOUNCING INTERNATIONAL IMPROVISED MUSIC ARCHIVE - an initiative to make texts on improvised music available also for future generations...take a look !! 030610 New department with CBN freeware compositions ! 030522 DEUTSCH: Komposition und Musiktherapie - Voneinander lernen. Form und Inhalt in der Musiktherapie (2003) - neues Artikel von CBN. 030415 PROUDLY PRESENTING: Edition Text & Graphix from The Society for Publication of Danish Music. Dansk udgave her. 030314. Oops + apologies - I forgot to update This Month's Quotation for March, is now corrected. 030220 DEUTSCH: Leserbrief für MusikTexte 96, 2003 - Demokratie, Interaktivität, musikalische Praxis. 030203 New interview with Carl Bergstroem-Nielsen. 021211 A server problem made email contact temporarily unavailable since sunday... this is now corrected. 021122 DANSK: SPOR Efterårsfestival 5-7/12 2002 - KOMPOSITIONSMUSIKKENS UDBRYDERE. 021122 DANSK: Anmeldelse af koncert med Ensemble Con Fuoco i Aalborg, 12. Oktober. The English edition of my EXPERIMENTAL IMPROVISATION AND NOTATION PRACTISE 1945-1999 is now up here at http://hjem.get2net.dk/intuitive/legno1uk.htm! I think I dare say it reflects my interest in reading and thinking about the music in addition to playing it, as well as my interest in mapping the territory. More than 650 entries, many annotated in length, so that the reader is informed about the contents of articles and books and about the ideas brought forward by them, not just the titles! Also included an overviewing text essay. It is my hope to make access easier to this big body of literature for all those interested. Your comments are welcome. So are also any links (se direct addres above), and I would be happy to be informed of them in case. 020930 PROUDLY PRESENTING! The article "Free Collective Improvisation in Higher Education" from 1995 by Charles C. Ford - on improvisation as a common subject offered to all students at Thames Valley University, London. See the full-text article here! 020924 DANSK: Pressemeddelelse fra Ensemble Con Fuoco om koncert i Aalborg, 12. Oktober. 020908 Concert in Copenhagen with Bela Hamvas Group for Intuitive Music. 020904 DIMC page updated with a report of the 2002 Conference! 020816 CBN list of works updated with CD releases (both Danish and English list - see under Carl Bergstrøm-Nielsen). 020626 DEUTSCH: Offene Komposition und andere Künste, Artikel von CBN, jetzt online! Über dänische Gruppen, viele zum Teil ungekürzte Beispiele von CBN, Jørgen Lekfeldt, Ivan Vincze, Max. E. Keller, Henrik Rasmussen, Niseema Marie Munk-Madsen. Beschreibung der Unterricht offener Komposition im Fach "intuitiver Musik" an der Univ. Aalborg, Musiktherapie, mit Beispielen von den Studenten Perla Leifsdottir und Line Normann. Auch theoretische Diskussion. 020626 Denmark's Intuitive Music Conference 2002 30th August till 1st September - programme is now up! 020415 DANSK: Gamle misforståelser om Cage: 4'33". Læserbrev af CBN. 020412 Vermittlungen - Musically speaking - online ressource of articles on improvisation teaching within music therapy training is now up! 011222 Denmark's Intuitive Music Conference 2002 have now dates . 011220 CBN holder foredrag om ny improvisationsmusik torsdag 17. januar 2002! SÅ er min nye bibliografi: EKSPERIMENTERENDE IMPROVISATIONSPRAKSIS OG NOTATION 1945-1999. EN KOMMENTERET BIBLIOGRAFI udkommet også elektronisk på min hjemmeside: http://hjem.get2net.dk/intuitive/legno1.htm ! Der er tale om et ret så kraftigt værktøj, tør jeg vist sige. 667 entries om emnet, mange med lange kommentarer og abstracts - og det er som hovedregel ting jeg selv har læst eller haft i hånden. Mere end en halv megabyte tekst. Hvad siger I så! Se selv... her vil jeg blot tilføje, at en papirudgave findes på Det Kgl. Bibliotek, Musikvidenskabeligt Institut i Kbh, Aalborg Universitetsbibliotek, AUM (Musikinstituttets håndbibliotek ved AAU) og på Musikkonservatoriet, Kbh., Musikkonservatoriet Odense (=Odense Universitetsbibl., Musikafd.) og muligvis flere steder (kan være under opstilling stadigvæk, men man kan jo spørge. - Og den engelske udgave? Jojo, den er på vej, hør ind hvis behov. Spørg og kommentér gerne hvis behov idetheletaget, men brug lidt tid først selv hvis det gælder elementær navigation rundt i den store tekst. Og...det gælder i høj grad om at spille, javist, men lidt forståelse og orientering skader jo ikke.